This is the year that all us 1977 babies turn 29! Today Crissy turns the big 2-9. Happy Birthday Sam! ( I call her Sam). She is the first to hit this milestone. It is the last year of your 20's, make it a good one. She is going to kill me over this picture, but it was the only one I have. Oh don't worry, she is not crazy. 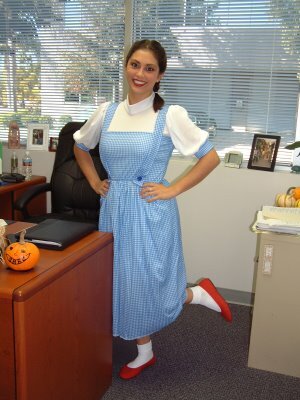 She is dressed up as Dorthy because it was Halloween. She doesn't dress up like that everyday. Infact Crissy has a great sense of style. I even mentioned it in my speech at her wedding. We have been friends for about 15 years and she is truely like a sister to me. She is hard working and dedicated and fun. She loves her dog as if it was her child and is a wonderful step-mom to 2 great girls. I might have to seriously hurt you Willis!!!! What were you smoking when you decided to post this? You have known me for how many years?, and you only have this pic? If I wasn't such as happy birthday girl I would hunt you down!!! i remember when she would come by and say hi to the family im pretty sure it was her but she's a hottie lisa!! !